Every Box contains One Autographed Memorabilia Card, Two Autographed Cards, Two Memorabilia Cards, Five Inserts, and One Silver-Wrapped Parallel Box Topper! 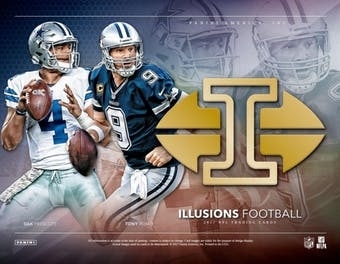 New for 2017, Illusions Football morphs the past with the present! Illusions takes you back to the 1990s and 2000s while also taking advantage of new technology to bring collectors a one-of-a-kind product! Each box will include 1 autographed memorabilia card, 2 autographs, 2 memorabilia cards, and 1 silver-wrapped card (base parallels can only be found in the silver packs)! Look for dual-signed cards from: Rookie Dual Signs, Rookie Reflection Dual Autographs, and Mirror Dual Signatures. Other autographs include: First Impressions Memorabilia Autographs, Rookie Signs, Veteran Signs, Rookie Endorsements, and the popular Elusive Ink! 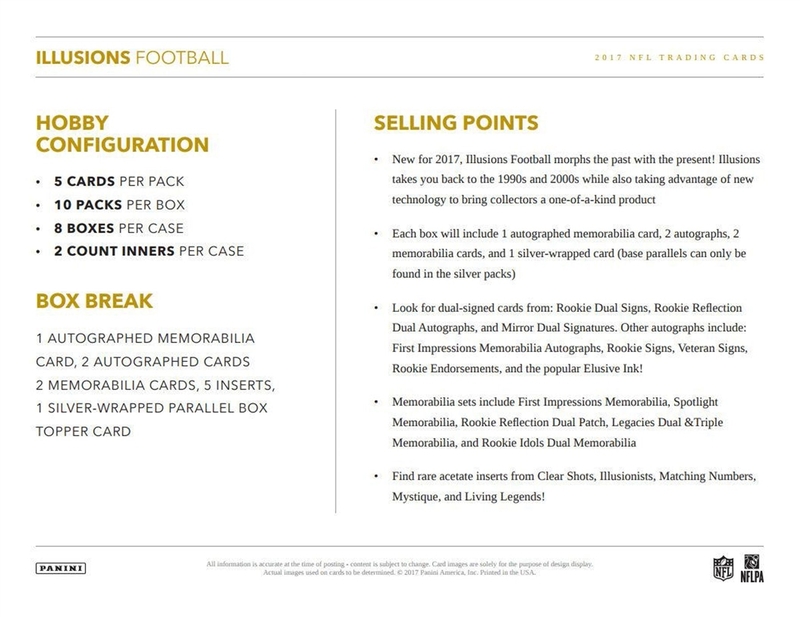 Memorabilia sets include First Impressions Memorabilia, Spotlight Memorabilia, Rookie Reflection Dual Patch, Legacies Dual &Triple Memorabilia, and Rookie Idols Dual Memorabilia! Find rare acetate inserts from Clear Shots, Illusionists, Matching Numbers, Mystique, and Living Legends! (#'d/50), Green (#'d/25), and Purple 1-of-1. Parallels will only be found in the silver packs. FIRST IMPRESSIONS MEMORABILIA AUTOGRAPHS PURPLE: 2017 NFL Rookies make their First Impression on Illusions in this RPA. Includes Blue, Red, Green, and Purple parallels. ROOKIE REFLECTION DUAL PATCH AUTOGRAPHS BLUE: Top 2017 NFL Rookies pair up for Rookie Reflection Dual Patch Autographs. Every card will include prime or super prime material! Purple parallels, sequentially numbered as low one! 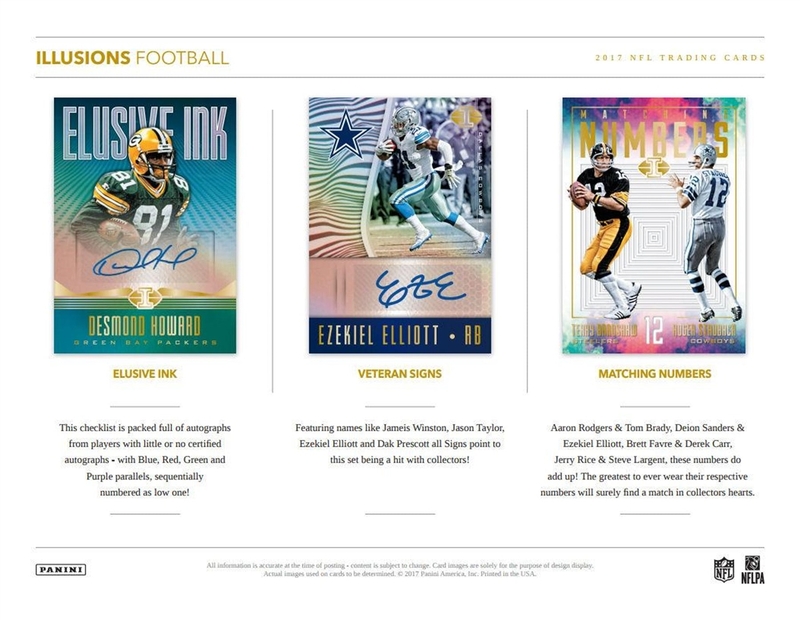 VETERAN SIGNS: Featuring names like Jameis Winston, Jason Taylor, Ezekiel Elliott and Dak Prescott all Signs point to this set being a hit with collectors! MATCHING NUMBERS: Aaron Rodgers & Tom Brady, Deion Sanders & Ezekiel Elliott, Brett Favre & Derek Carr, Jerry Rice & Steve Largent, these numbers do add up! The greatest to ever wear their respective numbers will surely find a match in collectors hearts. MIRROR DUAL SIGNATURES: Look for these pairings: Charles and Rod Woodson, Emmitt Smith & Ezekiel Elliott, and Richard Sherman & Earl Thomas III! This dual-signed set blends retired, veteran, and rookies. Includes Blue, Red, Green, and Purple parallels. 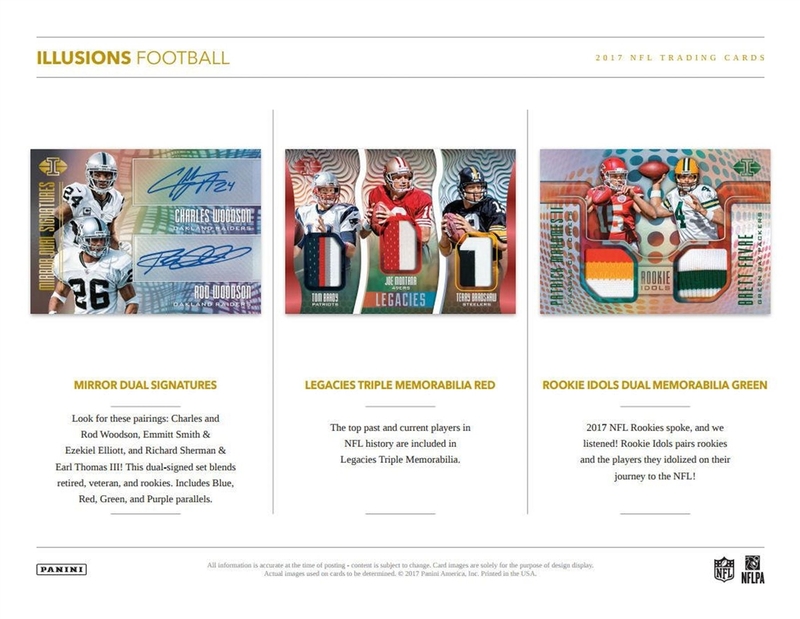 LEGACIES TRIPLE MEMORABILIA RED: The top past and current players in NFL history are included in Legacies Triple Memorabilia. ROOKIE IDOLS DUAL MEMORABILIA GREEN: 2017 NFL Rookies spoke, and we listened! Rookie Idols pairs rookies and the players they idolized on their journey to the NFL!